Remember the list of the Spendwise mom's favorite finance books? Here's another book review! 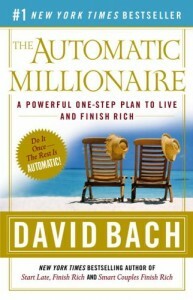 The Automatic Millionaire by David Bach is another great finance book, especially for those that have a hard time budgeting. The main principle he stresses in this book is the importance of automating everything: savings for retirement, mortgage payments, etc, because then you don't have to do it yourself! Also, when you automate, you take out money for yourself first, and then you only have what is left over to spend on your other expenses. 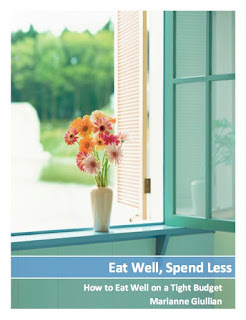 By conditioning yourself to living on less, you are saving without realizing it. One of my favorite concepts he talks about in the book is the latte factor. The latte factor refers to something we buy regularly, but that isn't extremely expensive. Because we buy it so often, we don't realize how much we spend on it. For example, if you buy a coffee for $3.00 every day, that is $3.00 you could be investing...and over time, sacrificing that coffee can save you thousands, not just from the money you don't spend, but also from the interest you gain from investing. I believe he mentions this in one of his other books, Smart Couples Finish Rich (which is another great book for anyone who is married, and could make a wonderful wedding gift, too!). And, my impression is that it isn't a new concept- in fact, the ideas he presents are not new, he just shows how to apply them in the automatic setting. I decided to see what my latte factor was: before, it was the vending machine near my office on campus. I am no longer in school, so I don't have that temptation anymore. But, since we've moved, I've developed a new latte factor: french fries. My son LOVES french fries, and it is so easy to stop by and get him a snack when we go out on errands, especially when he is being an angel. And, while I don't buy them every day, I will usually get them once a week. So, I'm going to try to stop buying fries, and either pack a snack or just wait until we get home! This book also has a great list of resources for the beginning investor, and it is at a very readable level (even I could understand it!). His examples illustrate the principles behind investing. In particular, there is one page where he shows what effect that time has investing. If you start now, you can make a lot more than if you were to put the same amount of money at a later date. Many of the ideas he mentions are nothing new. In fact, as I was reading this book, it was interesting to me to see what similarities there were between this, the Millionaire Next Door, and Total Money Makeover. So, I would recommend reading one of the three, unless you really like reading finance books. This was definitely my favorite of the three. It is a lot shorter, is a lot less 'strict' than Total Money Makeover, and has a well laid out plan to achieve what is mentioned in The Millionaire Next Door. Sounds like an awesome book. Thanks for sharing! I especially relate to the latte factor. I have to eat organic food, due to physical problems, doctors orders. Everyone knows how expensive that can be. I have to be very careful when in the healthfood store not to buy "lattes", in the form of the higher priced nuts, power bars, bakery products, processed foods that I can make myself, etc. I stick with the basics, keep my diet simple using only the lower priced foods, cutting out the "lattes" and my purse and health thanks me for it.